To face climate change, several green island projects are taking place across the globe. Island residents want to be part of a more efficient and sustainable world. To support ecological transition and help stop global warming, electric utilities who supply islands play a key role. They need to implement smart grid solutions for improved and more sustainable energy networks. Many islands are dependent on imported fuel oil. They must grapple with increasing electricity costs and reliability issues in part because they are isolated, and they don’t benefit from economies of scale. Also, during bad weather or rough seas, diesel shipments are sometimes stopped, and island residents stay without power. Shipping costs are high, and the risk of a serious environmental disaster is real. Besides, these fossil fuels (coal, natural gas and oil) which are burned to generate power, seriously impact our health and environment. We all know that when the fuels are burned, they emit toxins and global-warming emissions, which impact climate change. Even the waste products are hazardous to public health and the environment. The consequences are sometimes easy to see, such as air and water pollution and land degradation, and sometimes less obvious, such as the costs of asthma and cancer, or the impacts of sea level rise. Because islands, which are probably the first to be affected by climate change, often hold promise with respect to renewables, many green initiatives are blooming in such locations. Electric utilities need to fully support this transition to resilient, low carbon projects. Innovative solutions about energy supply are essential to help island inhabitants become green. One of these involves the development of a smart electricity grid. It’s often the key for a successful transition. Smart grid is not a buzz-word. Efficient smart grid solutions can enable the implementation of advanced monitoring, control, and automation functions, and apply cutting-edge communication technology for local and remote operations. So, power blackouts are minimized, grid performance is optimized and operating costs are reduced. Far more significant, smart, digital grid technologies increase the penetration of renewables in the grid, which is essential to turn islands into fossil fuel-free territories. 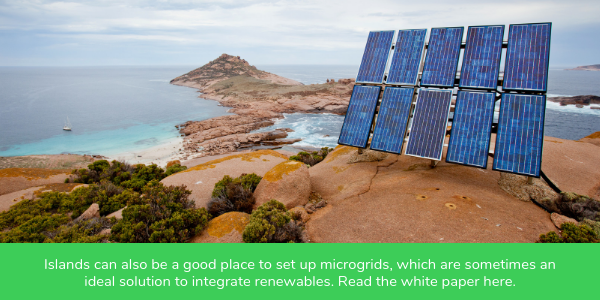 With this kind of high-level integrated architecture, islands can rely on a green electrical grid. They can reach their low-carbon objectives and stop contributing to global warming. How solar power gets a boost with smart grid solutions Grid Parity vs. Grid Quality: The Smart Grid Self-healing capabilities of smart grid solutions minimize blackouts There is no TEAM in SMART GRID. Five E’s can change that.